It’s spring cleaning time! Are you daunted yet? This is that time of year when tradition dictates you start culling all that wonderful “stuff” that steadily encroaches on your beautiful mid-century modern home all year. After all, minimalism is the baseline aesthetic for a lot of these places. Digging out from under our stuff is a hard job, and one we’re all inclined to put off. But there are ways of making minimalism work in the real world. Or at the very least, to manage our accumulated tchotchkes. 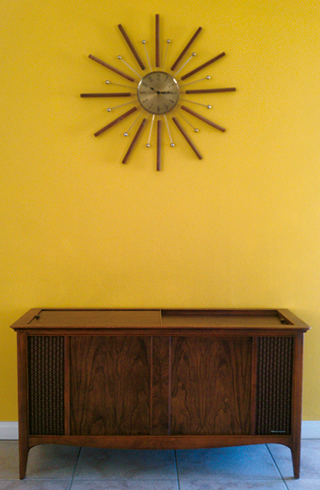 An insightful blog post by Pam Kueber on Retro Renovation points out the inherent conflict between the minimalist aesthetic of mid-century modern design and the people who actually live in those homes. It’s a bit ironic: If you’re into retro, you probably collect stuff, and that doesn’t work for minimalism. Even MCM design legend Vladimir Kagan said that while his designs are smooth and simple, his own home is crammed with tchotchkes. Kueber asked her readers to sound off on the duality, and they did, 111 times. You, dear reader, do not have time to read all those comments. But if you did, you would find hidden in them a few concrete, employable strategies people use to keep clutter to a minimum. So to save you time, we’ve compiled the 10 best of those ideas in the list below, quoting from the original readers' comments. Once you're through here, we urge you to take a look at the original discussion on Retro Renovation. I’m lucky enough to live in a small town where, if I truly do regret giving up a vintage piece, I can usually find it again in a consignment, thrift, etc. shop. Yes, I have been known to buy an item back. (Can’t believe I just admitted that.) –Annie B.